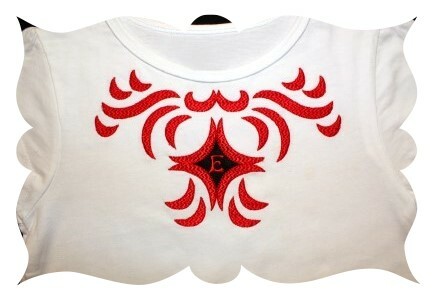 EXCLUSIVE *Tribal Necklace Monogram* Applique - 5x7 - $19.99 : Fancy Fonts Embroidery, Home of the ORIGINAL Trendy Dots Font! This EXCLUSIVE set comes complete with all 26 letters of the alphabet and the monogram letter is already embedded inside the "jewel" on the necklace so no need to worry about merging if you don't have editing software. 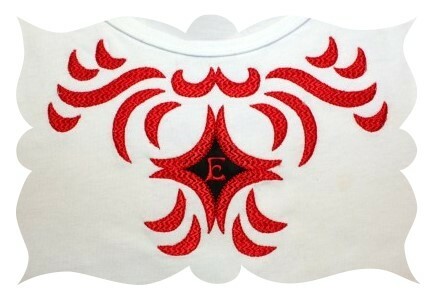 Like the design but don't want the monogram on the necklace? No problem! A bonus blank Tribal Necklace design is included! This design fits MOST 5x7 hoops or larger. Design Size: 4.81" x 7.66"